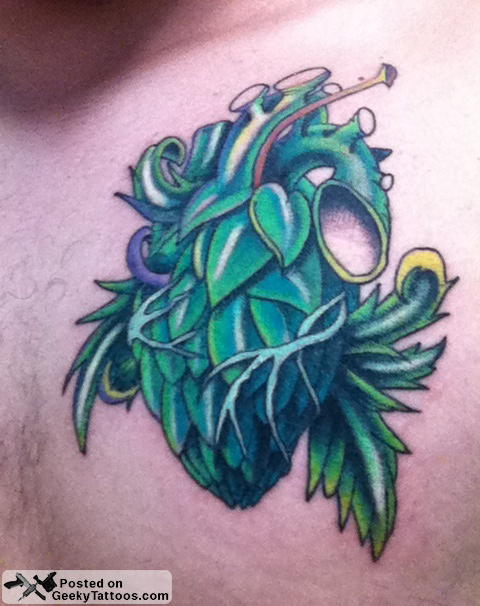 Daniel Soto @ Blood Thirsty Tattoo recently did this hop/heart hybrid on me. It is superimposed over my actual heart to help aid in people recognizing the heart portion; I didn’t want to go so over board with the heart portion that it became grotesque. The inside of the veins/arteries are left blank so that beer spraying out can be added later on. This is the best, thanks for posting! If it is "geeky" (which I don't think it is) then it's a cool geeky. It's sort of a creative slant on vine tattoos. Nice!